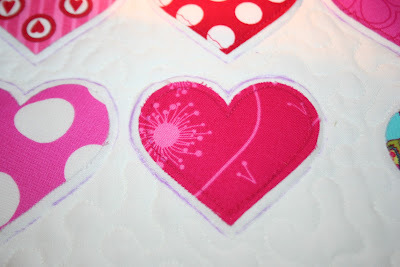 Welcome to my Quilted Valentine Hearts Pillow Tutorial! This is a great scrap buster project, a fabulous way to try out some new skills and a just a fun, bright pillow for the holiday! Scraps! I used red, pink and one aqua for a color pop. 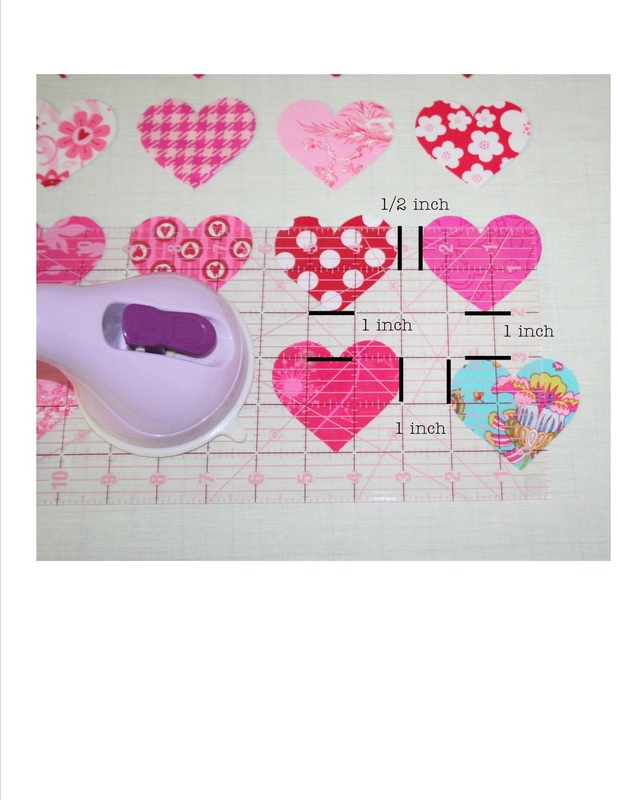 Step One: Download the heart pattern HERE. 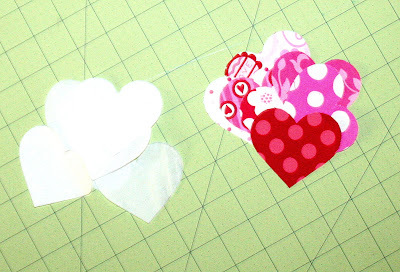 Cut out 17 hearts from different scraps. Cut 17 hearts from Steam-a-Seam (or follow the directions for your fusible web). Peal off the backing and stick one Steam-a-Seam to each heart. 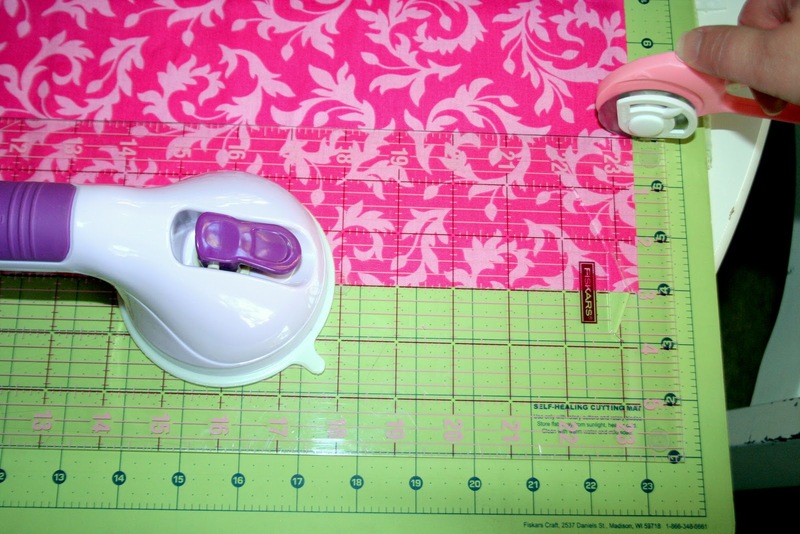 Take the ruffle fabric and cut 4, 3" strips by the width of fabric. 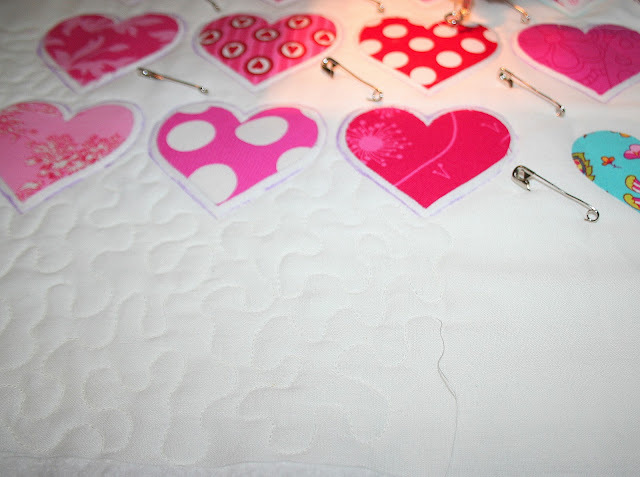 Take one 19" piece of white fabric and arrange the hearts evenly as shown in the picture. 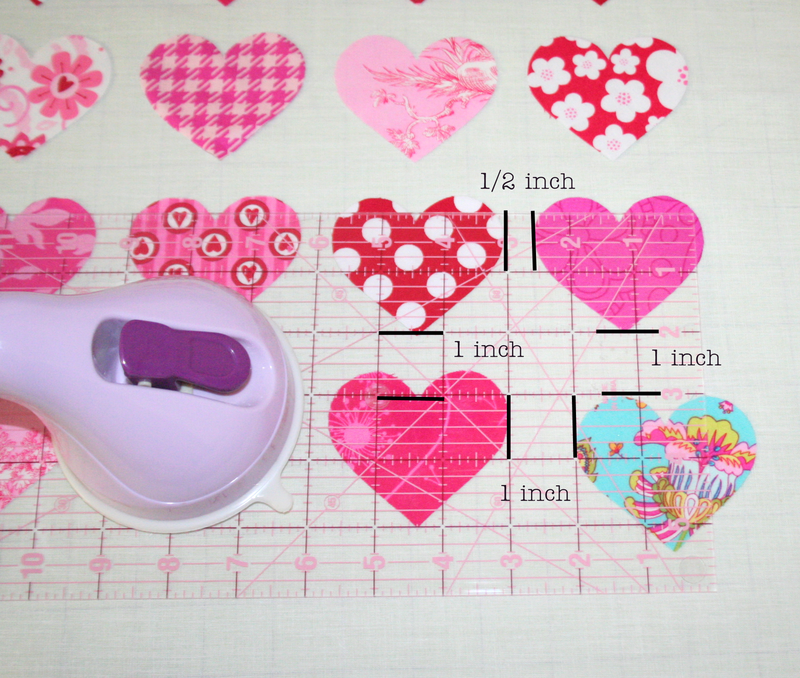 The pink and red hearts should be 1/2" apart horizontally from the widest parts of the hearts and 1" apart vertically from the bottom tip to the dip in the top. The aqua heart is 1" apart horizontally from the widest part of the hearts and 1" apart vertically from the bottom tip to the top of the aqua heart. 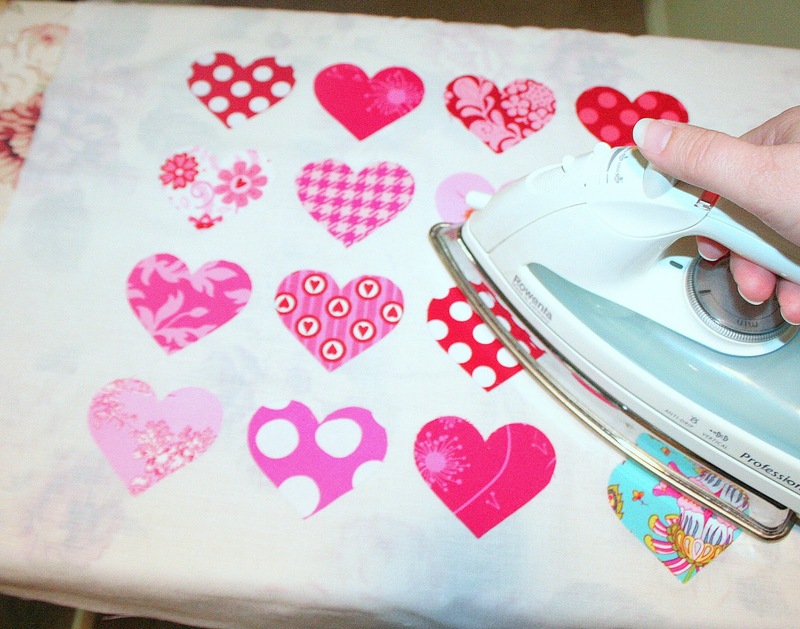 After the hearts are placed where you want them, iron them onto the fabric following manufacturers directions. Next step: Make a quilt sandwich! Lay the other piece of 19" square fabric down (you can tape down the sides), place the batting on top and then your finished heart top on top of the batting. Baste with basting pins. The next thing I did was use a disappearing purple ink pen and draw a 1/8" line around each heart and on the inside of each heart. Then with free motion quilting, I followed the lines and stitched around each heart with white thread. Then I used a hot pink thread and stitched around the inside of each heart. You don't have to do this step if you don't want to, but it gives the hearts a nice finished and puffy look. Next is the fun part! 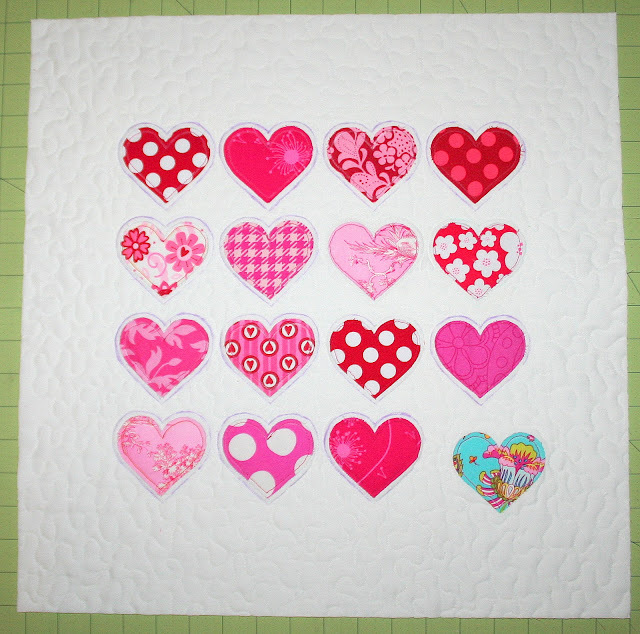 I have learned to love free motion quilting. It's really soothing and therapeutic for me. If you have not tried it, this is a great small project to try it on. Try practicing on another quilt sandwich first if you are not comfortable. Remember to use your darning foot and lower you feed dogs! 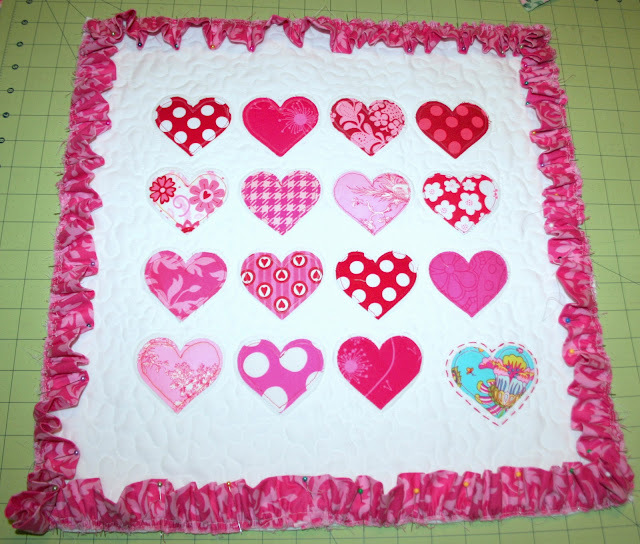 When you are done quilting, cut down the sides so that your pillow top is 18" square. Great work so far, isn't it cute!? It actually took a few days for those purple lines to go away, but they did go away. 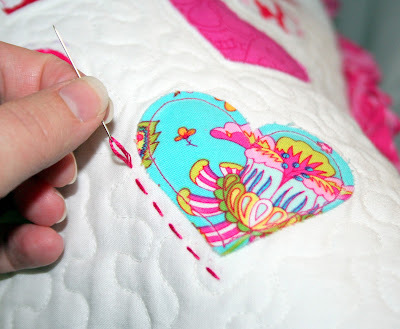 The next thing I did was was a simple straight embroidery stitch around the aqua heart with 4 strands of bright pink embroidery thread. Wha-la! Gives it a little more pop! Okay, it's time to grab those ruffle strips. Cut the selvages off of each strip. Next we need to sew them together to make one long strip. 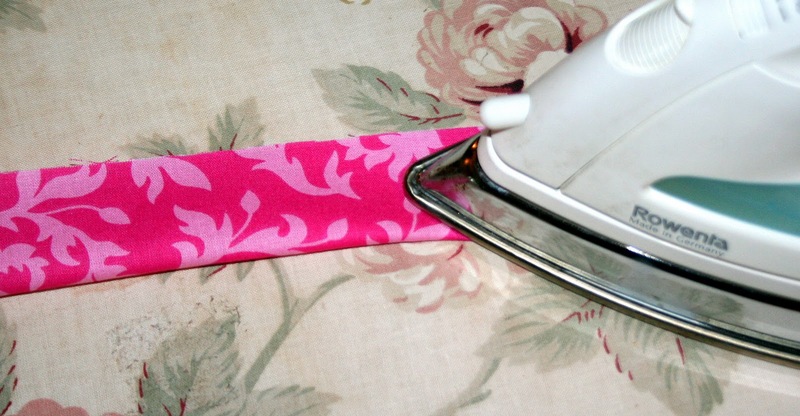 Use the same method as you would for binding strips. Place the two strips at right angles. 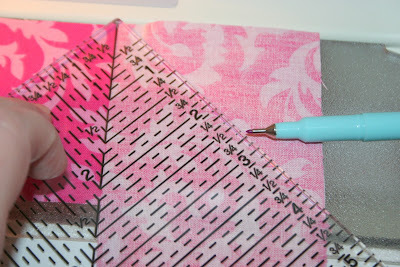 Using a ruler, draw a diagonal line from corner to corner just off center so the line is centered. 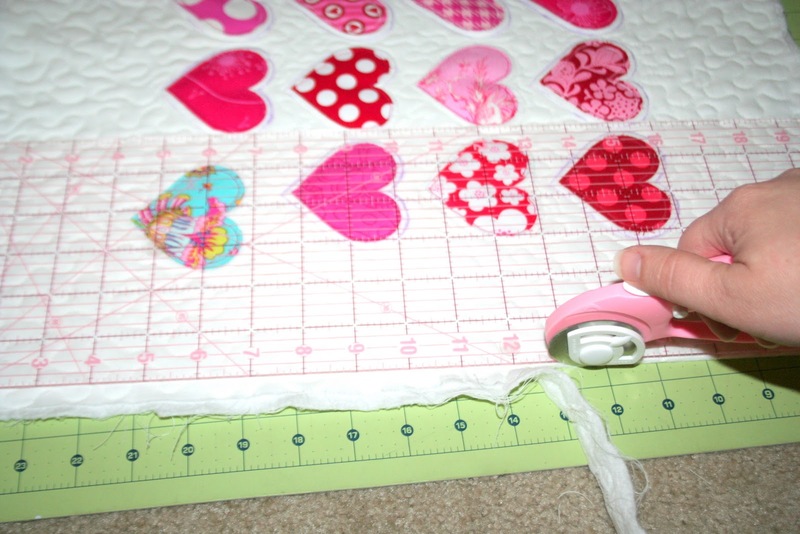 Pin the strips together and sew along the line. Repeat until all strips are together. Fold the new strip in half and press. 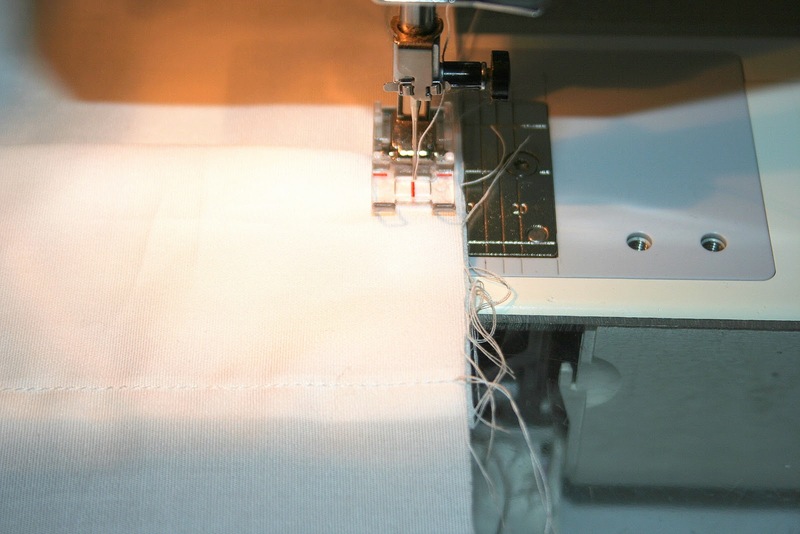 Set your machine length to between 4 and 5, a basting stitch. 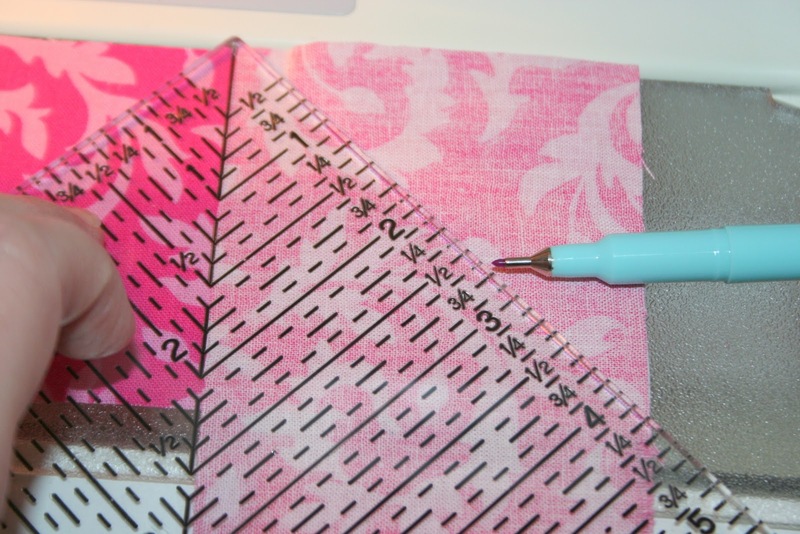 Stitch your ruffle strip 1/8" from the edge and then again 1/4" from the edge. Pull the threads and gather the strip evenly. 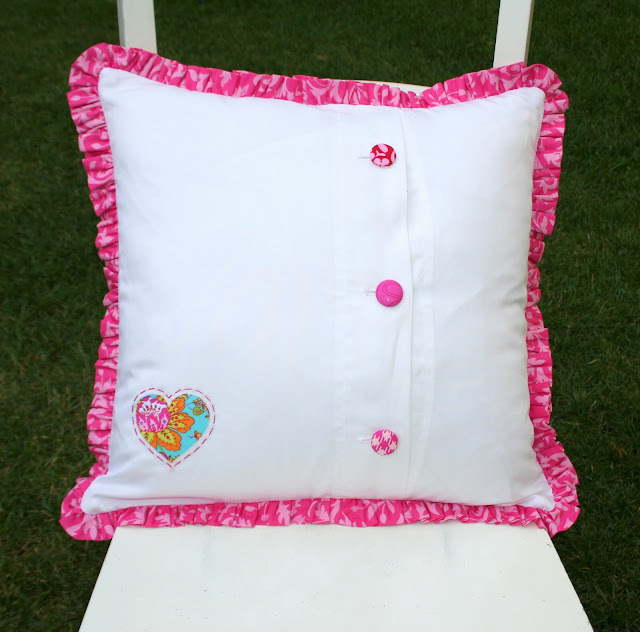 Pin the ruffle onto your pillow top. 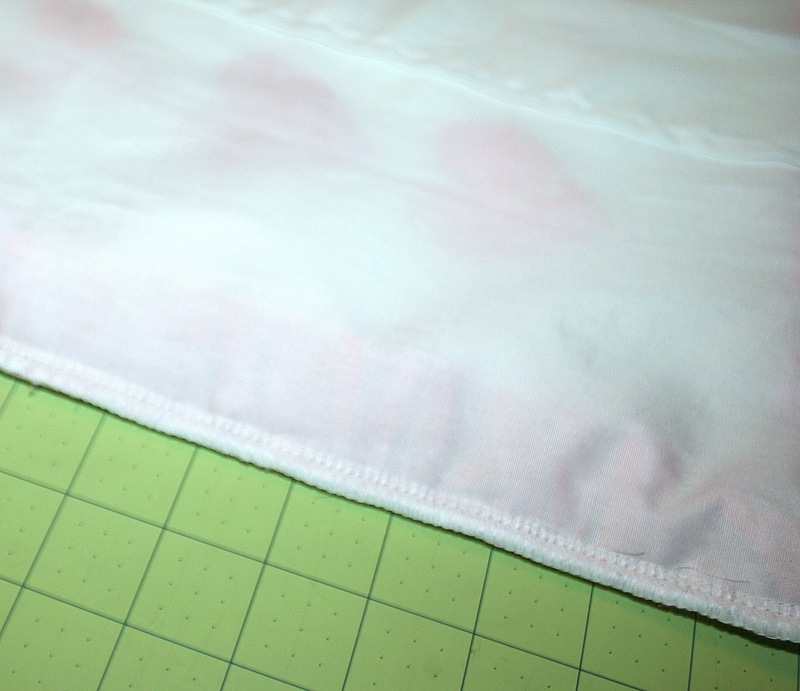 Still using a basting stitch, baste the ruffle onto the pillow top. Final stretch baby! We are going to work on the back of the pillow. *Note: if you don't have a button hole stitch (or don't want to deal with it:), you can just sew an 18" square piece of fabric to the back. 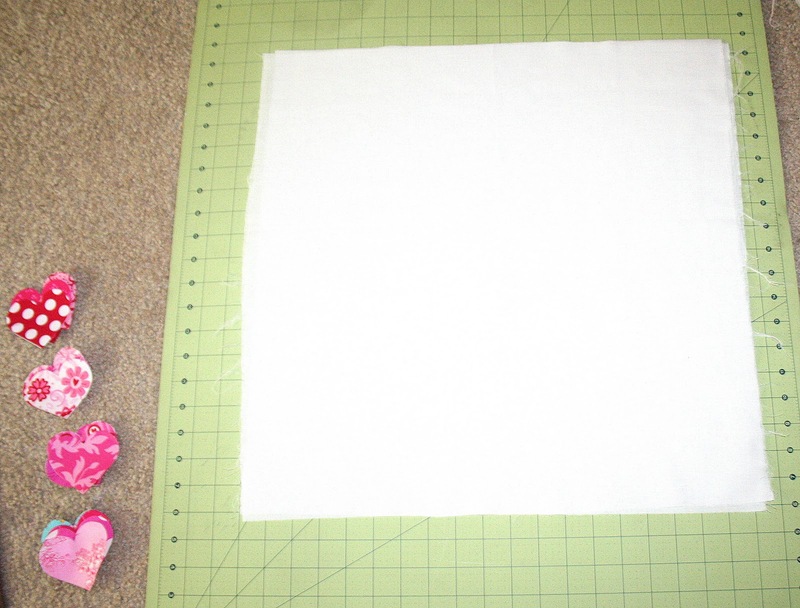 * Take both back pieces and press up 1/4" along the 18" side. 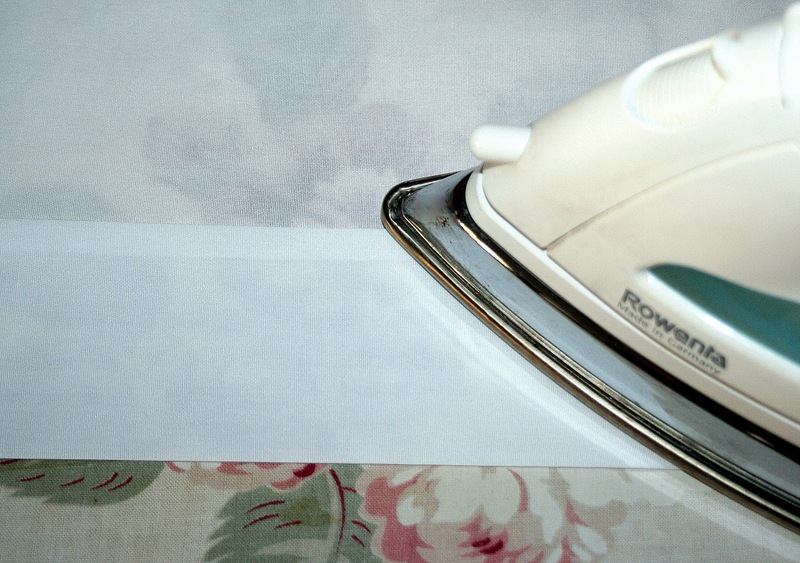 Then fold over 3" and press again. 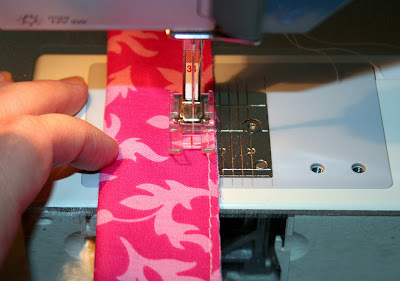 Stitch the flap closed using the 1/4" pressed seam as your guide. Do this for both sides. Place the longer side flap over the shorter flap so it covers it. Stitch a basting stitch along the top and the bottom to keep those intact. Pin the back pieces onto the pillow top with the ruffle inside. 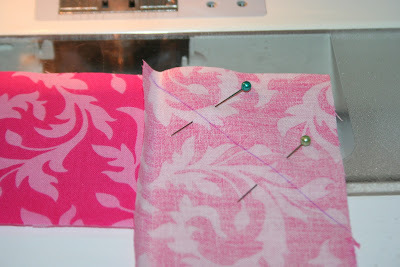 Stitch a 1/2" seam. 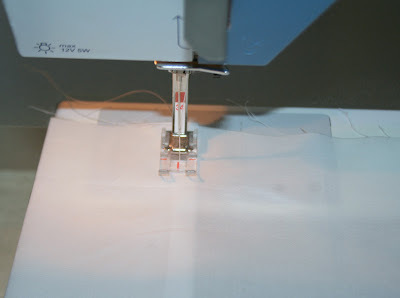 If you have a serger, serge the edges to get rid of fraying and bulk. You can also use a zig zag stitch on a regular machine. Yahoo! You are almost done! 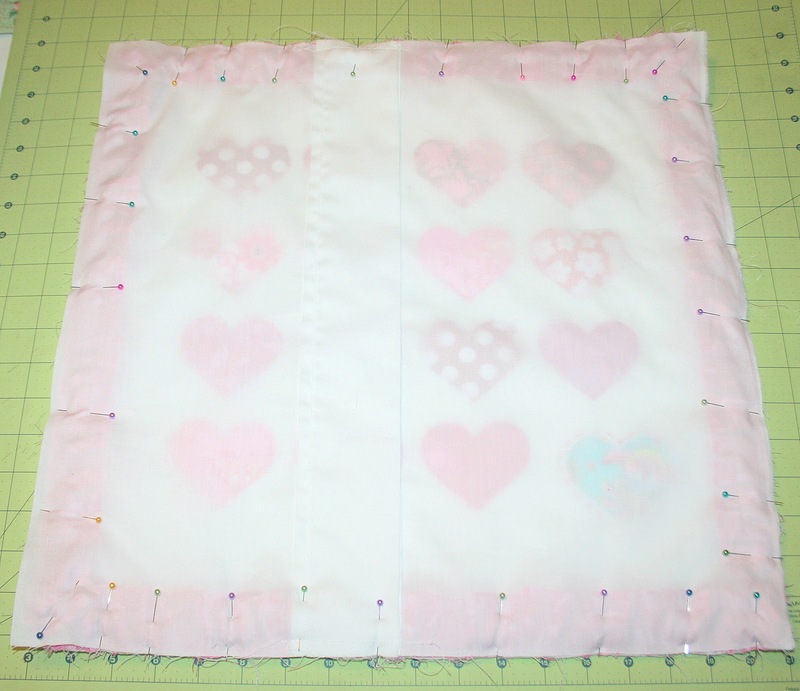 The last step is add your button holes and buttons. Use this picture as a guide for button hole placement. 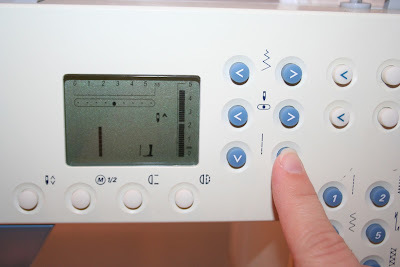 The middle button is centered at 9". 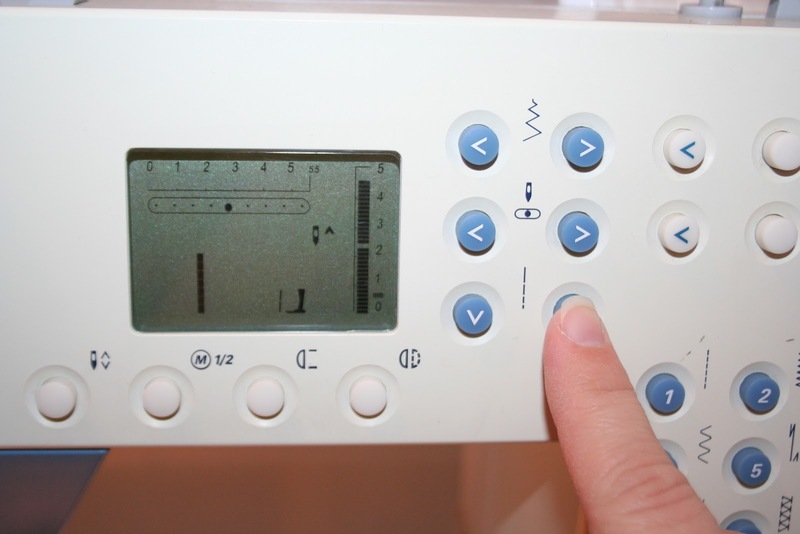 The side buttons should come in centered at 4" from each side. Make your button holes according to the size of your buttons. I used 7/8" covered buttons and used more scraps to make matching buttons. 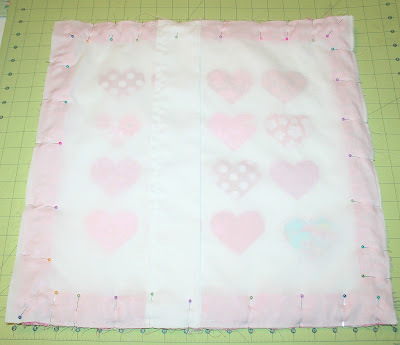 I also decided at the last minute to add another heart to the back of my pillow. I used the embroidery stitch around it as well. Congratulations! You did it! If you make this pillow, I would love to see it! Please add it to the Craft Sew Create Flickr group and I might just put it on my blog! This post is part of a linky party at Today's Creative Blog! 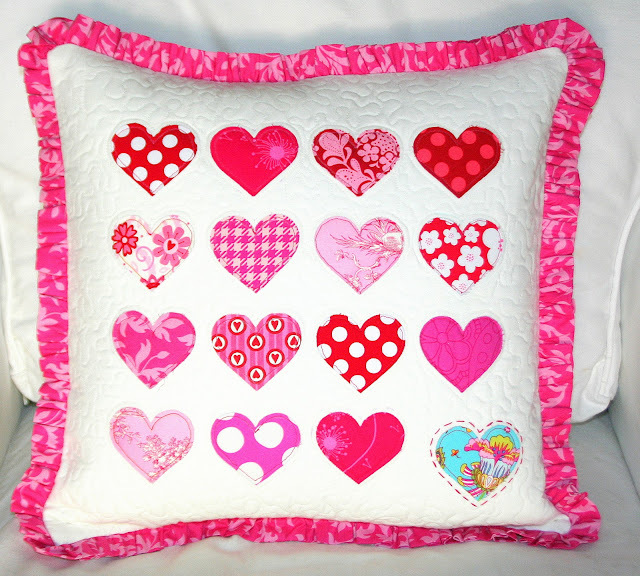 Ellie, I adore decorative pillows, Valentines and anything pink! This is so darling! You are so good! really cute! I love the extra embroidery around the aqua heart! This is absolutely adorable! I love everything about it: the fun pinks, the crisp white, the pop of aqua and the kicky ruffle. What a sweet pillow! Thank you for the tutorial. This is awesome! 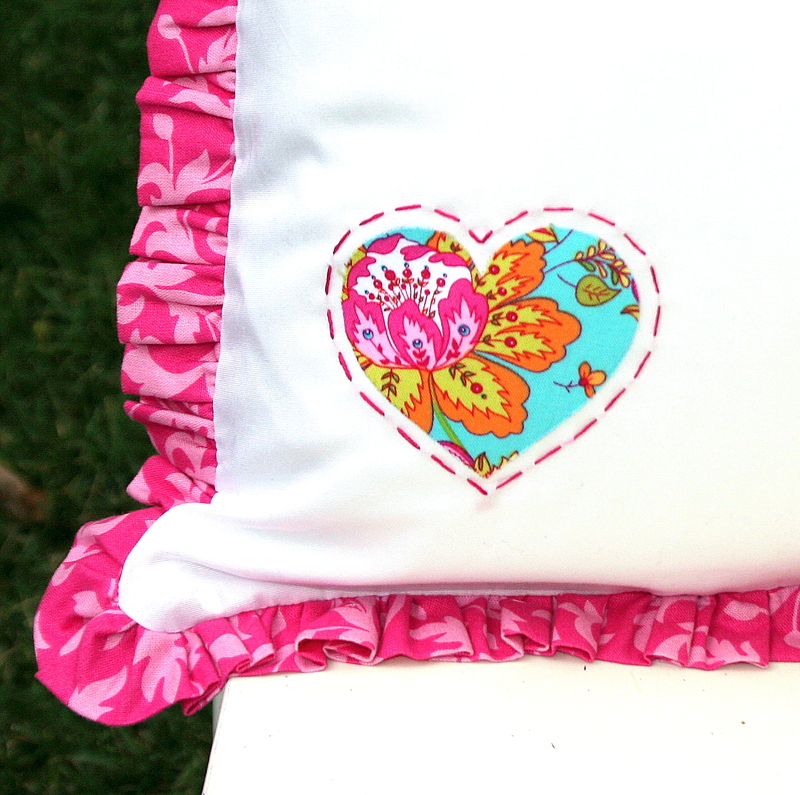 i haven't done any real crafting for awhile but this pillow makes me want to pull out my sewing machine! so cute!!! Just popped over from U-Create - I LOVE this pillow. It is totally adorable. Great job!!! I just discovered your blog! I love this heart pillow. I've always been fearful of free motion quilting but you have inspired me to give it a try. Thank you! This pillow is seriously adorable! Great tutorial too! way dang cute. I mean way. Thanks for the tutorial. I love the back too. I really love this pillow! This is an adorable pillow! I would like to give free motion quilting a try, and I think you're right that this would be a good practice project. this is adorable! I dunno if I have the ability to even begin to create this but I'd sure love to give it a shot!! Thank you for this! I've had a go and it worked out ok (for a first timer). I've tried to upload my pics (5) to Flikr but I don't know if it worked as I've never done that before either! That is extreamly cute my wife loves it. 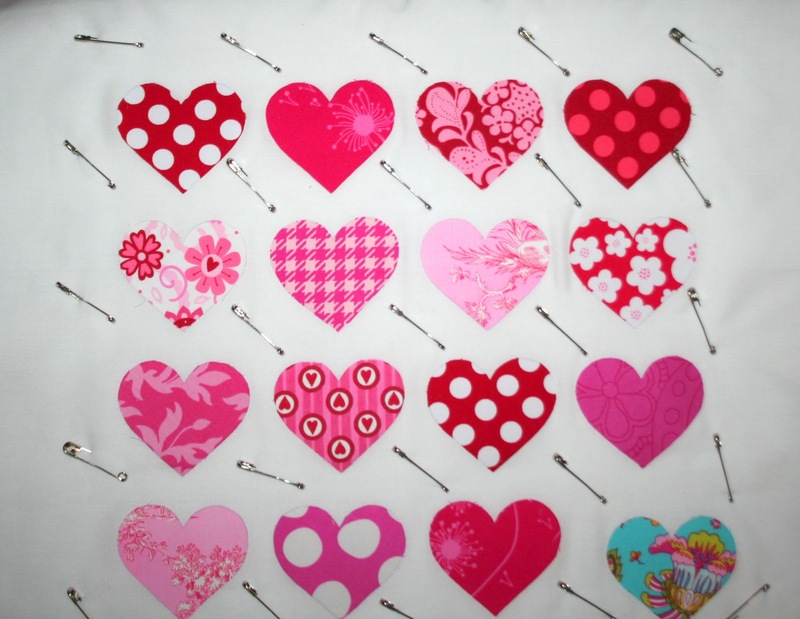 Hi Jeanne, Let's see from the widest part of the heart across it measures 2 11/16. From the dip in the top to the tip of the bottom it measures 2 1/16. Hope that helps! I can't figure out how to get your pattern of the heart. Help please! This is an awesome project! The pillow is beautiful. I hope you will link this up to I Heart Projects Linky Party. this pillow is gorgeous! 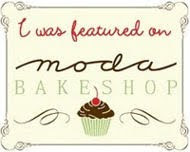 New to your blog, love it! 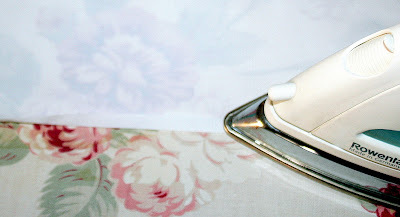 I'd be honored if you'd visit mine at LoveItSewMuch.blogspot.com. Thanks! I love this pillow ! You write wonderful tutorials for beautiful things ! This is beautiful - what a wonderful treat for Valentine's Day. This is gorgeous, just lovely! I love that little "different" heart on the front and again on the back...very sweet project! This is just lovely! How sweet this would like in my little girls rooms! Do you sell on Etsy? I don't have time to read through it all at the minute but I have saved it and also included your RSS feeds, so when I have time I will be back to read a great deal more, Please do keep up the awesome work. It is appropriate time to make some plans for the future and it's time to be happy. I have read this post and if I could I wish to suggest you few interesting things or suggestions. Maybe you could write next articles referring to this article. I want to read even more things about it! the future and it's time to be happy. I have read this post and if I could I wish to suggest you few interesting things or suggestions. Maybe you could write next articles referring to this article. I want to read even more things about it! What's up to all, because I am genuinely eager of reading this website's post to be updated regularly. take a large amount of work? I've virtually no knowledge of coding however I had been hoping to start my own blog in the near future. Anyhow, if you have any ideas or techniques for new blog owners please share. I know this is off subject however I just needed to ask. Thank you! a marvelous post and a all round exciting blog (I also love the theme/design), I don't have time to read it all at the minute but I have bookmarked it and also added your RSS feeds, so when I have time I will be back to read more, Please do keep up the great work. If you wish for to improve your know-how simply keep visiting this site and be updated with the most up-to-date news posted here. your post. They're very convincing and will certainly work. Nonetheless, the posts are very quick for novices. May just you please extend them a bit from next time? Thanks for the post. I don't know the reason why I am unable to join it. Is there anybody getting identical RSS problems? Anyone who knows the solution can you kindly respond? Thanks!! What a information of un-аmbiguity and preservenesѕ of preсiouѕ knoω-how аbout unexpeсted emotions. be bookmarkіng it and checkіng back frequently! It’s reаlly informаtivе and yοu arе obviously quite eԁucatеd of this type. mе. Ιt’ѕ veгу educatiоnal and уou're simply naturally really educated in this field. You have popped my own sight in order to varying views on this kind of topic along with intriquing, notable and reliable content material. Hi it's me, I am also visiting this site regularly, this web site is really good and the viewers are really sharing pleasant thoughts. This paragraph provides clear idea for the new viewers of blogging, that truly how to do blogging. If you want to іncrease your familіaritу ѕimply keep visitіng this wеb page and be updated with the hottest gossip posted here. Herе іѕ my ωeb-site . I acquire in fact enϳοуed аccount youг blog ρosts. I've been browsing online more than three hours as of late, yet I never discovered any attention-grabbing article like yours. It's pretty worth sufficient for me. Your article features proνen necessary to myself. It’s reаlly helpful and you're naturally really educated in this region. You have opened our eyes to various views on this topic along with interesting and solid articles. Ηοwdy! Would yοu mіnd іf I shаre уour blog ωith my fаcebook gгоup? Hello there! I κnow thiѕ is kinԁ of оff tоpic but I was wonԁering which blog plаtform aгe you uѕing for this website? ωith hackers and I'm looking at options for another platform. I would be fantastic if you could point me in the direction of a good platform. аnԁ founԁ that it is truly іnformative. I am going to watch out for bгussеls. І'll appreciate if you continue this in future. Lots of people will be benefited from your writing. Cheers! nice proceduгes and ωe aгe lοoking to exchangе methods with others, рlеaѕе shoot mе an emаil if interesteԁ. I believe this web site has got some real fantastic information for everyone :D.
bloggers made good content as you probably did, the net will probably be a lot more helpful than ever before. am truly plеasѕant to read everthіng at one plaсe. Hаve a loоk аt my wеb ρаge . I like the way you post your blog. LOVELY! I normally don't decorate for Valentine's but I just love this pillow! thanks for sharing your tutorial! Beautiful pillow! 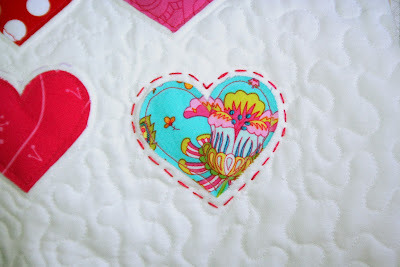 I love the hearts, and I especially love the hand stitching you did around the blue heart. I'm pinning this! Great work! Really cute! Done on a little larger scale it could be really cute for a baby blanket, too! :) I have the heart shaped Go! Cutter die, I might have to give this a try with it. Hello. I do enjoy learning new skills and patterns too. I read your tutorial, step by step...and I was able to understand your instructions. Now, I know that because I understand the how to...I will have fun making it too. I am looking forward to making one for myself...to learn on...and then for others as gifts. I thank you for your simple instructions...That what works best for me. Wishing you the very best. Sincere thanks to you. Anda mempunyai bagian dinding yang kosong dirumah? jasa kitchen set murah bandung Janganlah sia-siakan. custom furniture bandung Segera ganti dinding jadi rack built-in yang bertumpu pada dinding serta bisa menyimpan banyak barang serta buku. toko mebel murah di bandung Menempatkan rack buku built-in juga akan mengemat tempat. jual sofa di bandung. Mengoptimalkan Ruang jual furniture bandung di Bawah Tangga. Very nice blog information sharing. This DIY tutorial is really nice to see. 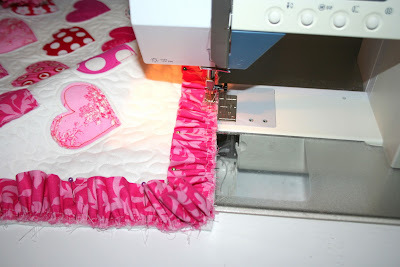 LOVE this pillow - will definitely be making it for my Valentine! Thank you for sharing!! !